BRYAN EATON/Staff Photo. 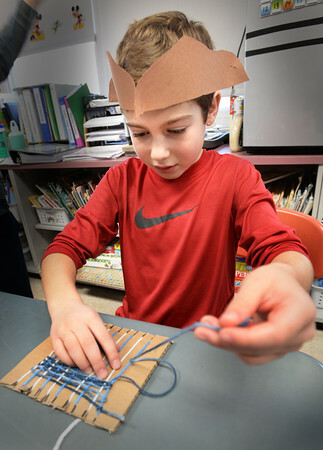 Wearing a cut-out period hat, Matthew Wirwicz, 8, works on his weaving at the Donaghue School in Merrimac. Third-graders were having Colonial Day learning about the daily lives of the settlers, from candle making, butter making and different games children would play.